Our very first “From the Hot Seat” post comes to us from Daniel Gans, the Director of Trial Support at TransPerfect Legal Solutions. Dan has been a long time TrialDirector user and has trial experience working in-house at law firms and on the vendor side. I have used this process for closings in the past few trials and it has worked great! It takes a little more time since you have to do an export and import but the outcome is worth the time spent. Often times during a closing, the rhythm of the presentation can be interrupted by the other side asking where something came from. I have found that by creating exhibits for presentation and making a few changes to the default description makes for a clean and streamlined presentation. 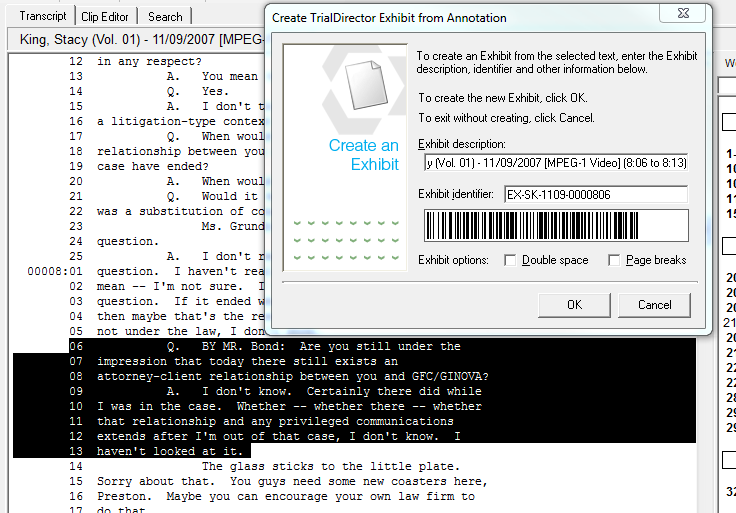 As an example, I will show an excerpt from the TrialDirector sample case. 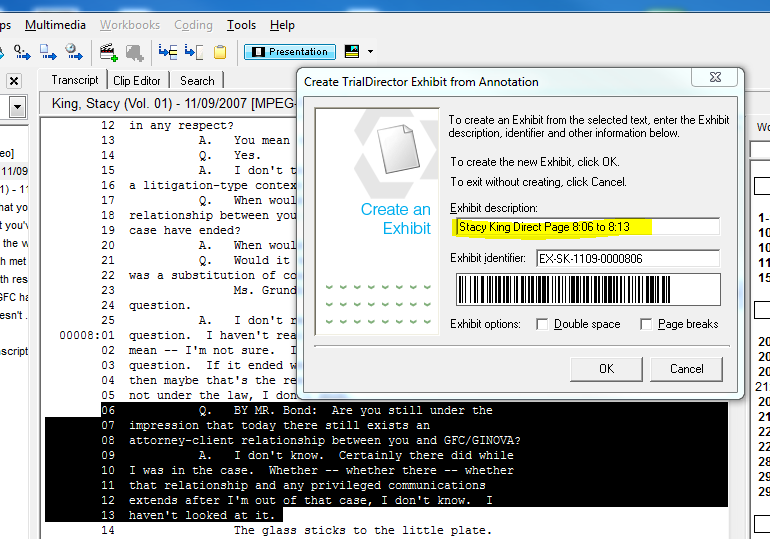 Next, I create a temporary folder for the closing and move all of the exhibits we intend to use into the folder. Note, this document is not yet endorsed. Now I have a set I can give to the legal team to review for their presentation and decide if they are going to use the excerpts knowing exactly how they will appear. For a working set I usually produce a folder of PDF files to the legal team with the working exhibit numbers on them. This workflow provides the team a working set to use and call out what exhibit they want to see. It is also very helpful if the legal team decides to skip around. Place the finished PDF files in a new folder and you have a set of documents for closing that has the text you want to present along with who said it, Direct or Cross and the page and line number. I hope others can find this helpful for their trial needs.